cupcakeMAG for Littles: Fashionable Treats for Chic Moms & Their Babes: Obsessed with Ambajam! I went to visit my dearest Ali from Ambajam in an emergency situation. “The son is sleeping with my PINK shirt, the hubs cannot stand it. He begs me every morning – don’t you have a more neutral shirt he can sleep with?” “Um, no,” I say “I heart pink and have a lot of it – no man-lies in my closet my dear husband..” And then *light-bulb moment* – AMBAJAM!! How could I have forgotten? The cutest, cuddliest, marshmallow-iest of fabrics. I would love to pad my walls with it (and the hubs thinks that with my craziness, I could stand to have padded walls). Oh how it’s been FOREV since I had been in Ambajam’s studio in Denver. Oh the bright colors, the snuggly soft fabrics draped everywhere – can you say AH-MAZING? The warmest place to be, even on the snowiest of days. I picked two mini cuddles for my mini man – green & blue and brown & blue. And Oscar has had to pry them outta my hands, I handed them over to him like a loving mother would. Not only does Ambajam have mini’s, and baby size, they’ve got jumbo’s for the adults too (just for MEEEE! Or my padded walls). So many bright and vibrant colors to choose from – anything is sure to suit your fancy. Also in their repertoire - more amazing products from hooded towels, cute little appliqué outfits, heirloom pillows and quilts, coin and make up purses, burp and wash cloths (take a breath) and blankets that give back to breast cancer. AND, I may or may not have seen a prototype for a robe…I’d have to drown you in fluffy softness if I gave you the full story…Adorable, adorable, adorable. Ali has done an amazing job finding her niche and perfecting her product. (And she’s an uber-cool lady to boot! Read all about her here). Whoa! I am going there now to use this code! Thank you! 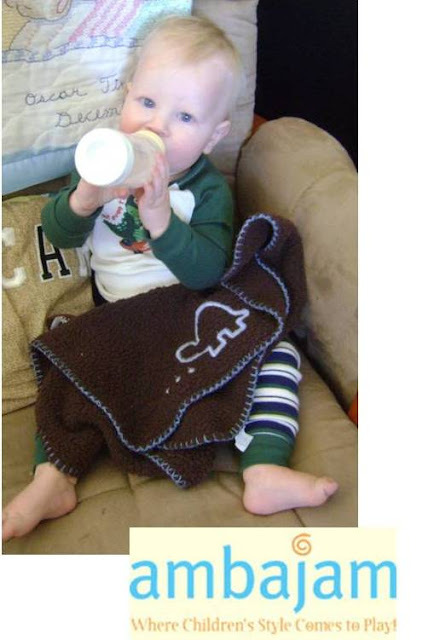 I have wanted one of these blankets for me....I mean for Baby D! And Oscar is the cutest little guy.